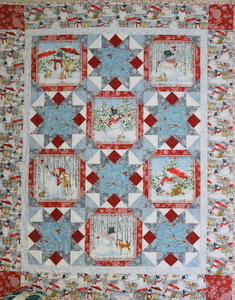 This winter quilt is made with a new line of winter fabrics that we selected for this demo. Quilt measures 50″ x 61″ and is made with greys, beiges and reds. Very bright and striking . The beauty of this quilt is that it can be displayed all winter.